Guest Carl Valeri is a commercial pilot and a flight instructor. He is also a prolific creator of aviation content. The broad appeal of his Aviation Careers Podcast goes beyond those looking for career advice. Its interesting to learn about what the jobs of others are like. We talk about airline furloughs and seniority lists, things to think about when considering flying for a different airline, the age/seniority situation and what that means after an airline merger. Carl talks about how the Sun N Fun activities support and promote aviation. It’s not just the annual event. Sun N Fun radio broadcasts great interviews year round at Sun N Fun Radio. Find Carl at the Aviation Careers Podcast (@FlyingCareers on Twitter), the Stuck Mic Avcast (@StuckMicAvCast on Twitter) and the ExpertAviator.com blog (@ExpertAviator on Twitter). Why are some airlines better at saving fuel than others? So let’s see them. David will choose one to record for the episode. The others we’ll either post or maybe use them in later episodes. Good Luck Future Airplane Geeks Historians. Steve and Grant have finally finished running around to various events in Australia (for now 🙂 ) and have (finally!) put together a “real” Australia Desk. They quickly review a few headlines before settling down to discuss a recent AirProx between two Qantas A330s. All that plus a shout-out to Aunt Benet’s piloting skills and news that Grant’s appearing in the latest Australian Pilot magazine from AOPA. This week our contributor from Spain Diego Lopez Salazar from AeroPodcast takes us behind the scenes at the Iberia Maintenance facility at Madrid Airport. In the first of two segments we hear all about seeing an A340 stripped down to its barest minimums, who owns the aircrafts tyres and how quickly emergency chutes are deployed. Crew – Morotai, 1944 from listener Doug Betts. 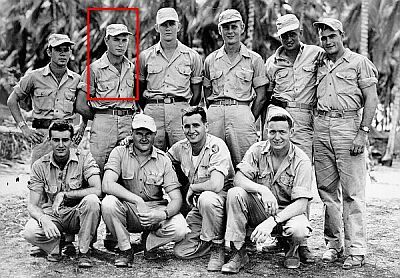 Doug’s father (highlighted) flew 52 missions in a B-24 of the 307th Bomb Group, The Long Rangers. 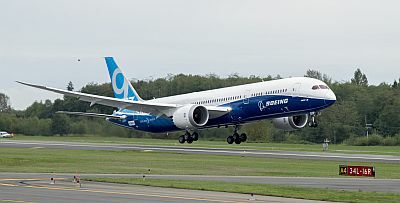 This entry was posted in Episodes and tagged B787, career, FAA, Flying Green, PED on September 25, 2013 by maxflight.